NHL Official. Hall of Fame Bowler. Hall of Fame baseball player. Friend of hockey and baseball stars. Memorable role in the The Natural. Bill Truman has had a front row seat for some of the great moments in Buffalo sports. That’s been the story of a great sporting life for the WNY native and Williamsville resident. If you bowl at Transit Lanes, you know him as the manager. Watch a Sabres game? You’ll see him in the penalty box as the supervisor of off-ice officials. If you played AAA-MUNY baseball, he’s the guy in the WNY Baseball Hall of Fame. Went to Kenmore West? He’s in their Hall of Fame. Watch The Natural? That’s him as the catcher watching Roy Hobbs’ dramatic homer sail into the light tower. Add it all up, and it may be be the most amazing collection of sporting achievements and connections of anyone you’ll ever meet. Today, it’s all wrapped in a 67 year old guy that everyone loves. He’ll never tell you about all of his great moments. So we will. It is the most iconic scene in the movie. Bill Truman had a front row seat. An injured and bleeding Roy Hobbs (Robert Redford) hits a game winning home run off the light pole to give the NY Knights the win. The catcher who notices blood on Hobbs’ uniform, then takes his mask off to watch the ball soar? Truman. Always knowing where the best seat was, Bill noticed that everything happened around home plate. So he asked to be the catcher. Now, that scene has Bill in another Hall of Fame. Go to Cooperstown and the clip plays on a TV in the video room of the museum. Anytime a player heads to the penalty box at Key Bank Center, it’s Bill who opens the door. For 36 years, he’s been an off-ice official for the NHL. For the past 10 years, he’s been the supervisor of all the off-ice officials. So whenever Rob Ray or Tie Domi or Chris Neil or any noted pugilist from the bygone days of hockey would head to their second home, it’s Bill who would greet them. 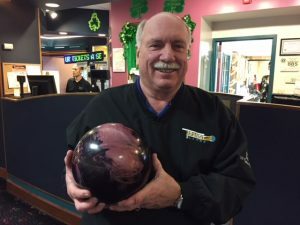 Bill is the longtime manager of Transit Lanes, one of WNY’s most popular and prominent bowling centers. The leagues that Truman runs are filled with the biggest names in Buffalo bowling. That means he’s become friends and mentors to most of them. Bill’s a pretty good bowler himself. He’s been part of teams that have won Buffalo city titles. 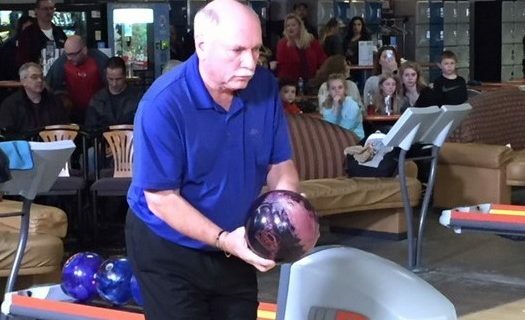 He has 15 career 300 games in his 55 years on the lanes. His bowling skills have earned him a spot in the Tonawanda Bowling Association Hall of Fame. Bill still carries a 217 average. This weekend, he’ll appear on WBBZ-TV’s Beat The Champ bowling show. He was one of nine bowlers out of 166 to qualify for the show. When you’re around all kinds of different sports, and you’re a great guy like Bill, you’re bound to make friends. Bill has a lot of them. He is close with former Sabres coach Lindy Ruff. Same for WNY native and former major league pitcher Joe Hesketh. He once roomed with former major league sensation Joe Charboneau. Of course, longtime Sabres like Rob Ray have known Bill for years. Based on 3207 career minutes in the penalty box, he probably considers Bill part of the family. Any of the area’s top bowlers…Jack Jurek, Tom Baker, Brad Angelo, Ryan Ciminelli, Mike Zarcone…have bowled with or against Bill. Or at least complained to him about the oil conditions at Transit Lanes. His friends wonder if Bill really does any work. All they see him do is watch hockey and watch bowlers. But Bill works hard at what he does. There’s no fooling all the people he’s touched, helped, entertained or befriended. They are fans of The Truman Show.